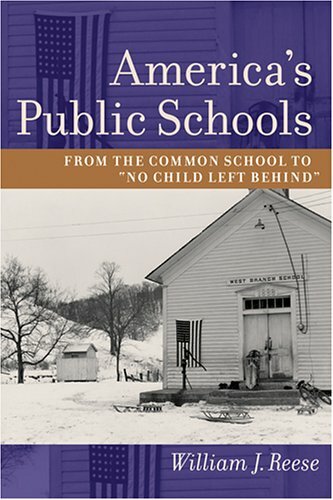 America’s Public Schools by William J. Reese is a comprehensive survey of the debate of the purpose of pubic schools since their inception nearly 180 years ago. It is the second publication of the book, which originally appeared in 2005. It is appropriate for undergraduate students who require a general overview the evolution of public schooling in this country or perhaps for a master’s level foundations course in policy, history, or the sociological evolution of schools; however, for doctoral level students, or in most cases, even at the undergraduate level, utilizing primary sources would most likely better serve the purposes of all involved. There are some redundancies and generalities that permeate that book, hindering its overall effectiveness. The book addresses the major philosophical and political underpinnings of the debate of the purpose of public schools in the country, addressing the genesis of public schools from the original one-room schoolhouse, the Industrial Revolution, the Harvard Ten, the Progressives (led by the ever-controversial John Dewey), the move toward vocational training, and the country’s infatuation with testing. In many ways, the material is fascinating. The entire history of American education, or perhaps America itself, is encapsulated in this accounting of America’s Public Schools. It is both informative and alarming to consider the central themes of the book—alarming because it is entirely possible, if not likely, that a majority of legislators, business leaders, school board members, school administrators, and teachers, alike, are making policy, shaping the future of this nation, formulating academic recommendations, or interacting with students on a daily basis without a general working knowledge of the precepts of this book. To the extent that this is true, accounts for why educational professionals have relinquished decision-making power to the ignorant. The clueless souls to whom that statement applies need to read the book yesterday. Many Americans view their existence through a perspective that does not honor the past: New is good, old is bad; however, in this case, it would be wise for all of our citizenry to understand that the debate about how much schools should train students for vocational careers or prepare them for college, whether they should be lectured to or discuss issues in groups, who should pay and/or if education should be accessible to all or a private endeavor, etc., etc., did not begin in 2002 with No Child Left Behind, in 1983 with A Nation At Risk, in 1957 with Sputnik, in 1954 with Brown vs. Board of Education, but in fact all the way back to the 1830s when public school’s began at the behest of Horace Mann and others. America’s Public Schools is solid, if not perfect. The general citizenry should know the material discussed in these 384 pages, and most do not. Educators, legislators, and elected officials should consider this prerequisite information and know much, much more. The fact that most don’t even know this information as minimal and foundational is sad indeed.